Fall into utter comfort and stylish prestige with the Zaha Relaxing Chair, a distinguished mix of modern elegance from Design Warehouse. A mid century modern chair, which incorporates incredible materials and decisive design elements, the Zaha Relaxing Chair is a superb piece for many different spaces. Featuring a wide, rounded back, deep seat and light airy legs, the Zaha Relaxing Chair is celebrated for its chic simplicity. Why not incorporate this gorgeous chair into your teak deep seating set up as a fabulous alternative to a chunky club chair? Tie the look together with cushion colours and a concrete coffee table – you’ll have created an urban haven to be envied! The Zaha Woven Relaxing Chair is made from a fabulous range of materials, beginning with the powder coated aluminium frame, which alongside being very attractive is long lasting and suitable for outdoor use. Outdoor rope is woven and wrapped around the frame with expert precision. Finally, to top off this extraordinary blend of quality and style is a Sunbrella® cushion – the best kind of outdoor fabric for exterior use! It comes as no surprise really that we are proud of the incredible makeup of the Zaha Relaxing Chair! Also in this collection is a dining chair, so you can create a fabulous cohesive look that you will adore! Set the dining chairs around your big teak table and create a comforting nook for after dinner with the tranquil sophistication of the Zaha Relaxing Chair. 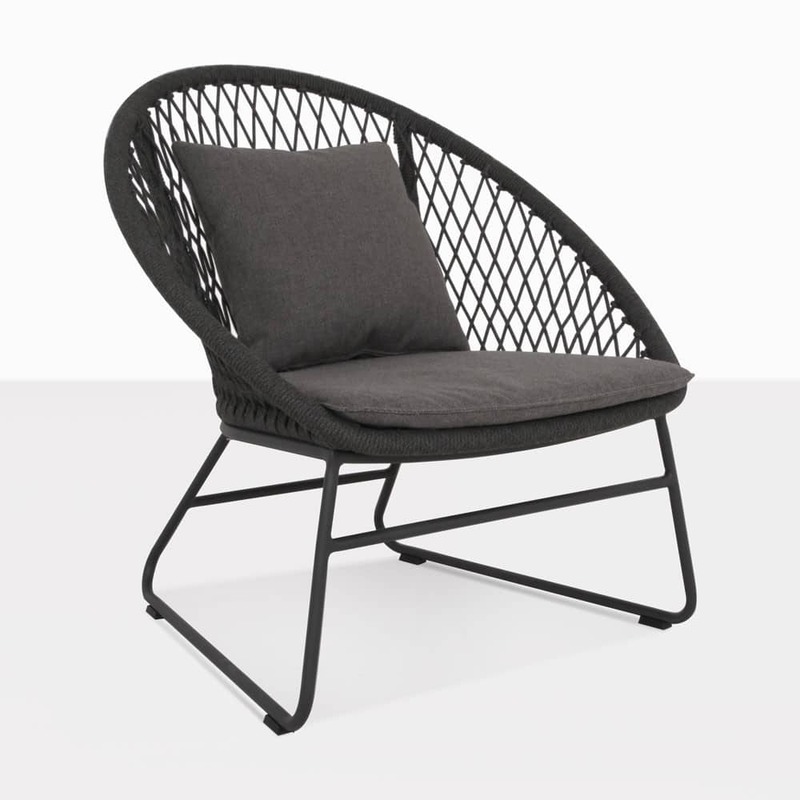 The Zaha Relaxing Chair is exclusive to Design Warehouse. Call us today to bring that fabulous, unique flavour to your home.